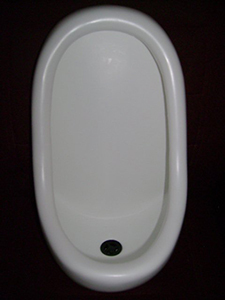 The aesthetic “Polyrinal” waterless urinal is moulded in a single piece from L.D.P.E, thereby eliminating any leakages through seams. It is very robust and virtually indestructible, and it features a grid incorporating a non-return rubber valve to exclude odours. A “P” trap is, therefore, not required. The “Polyrinal” has a keyhole mounting at the top of the unit, and is supplied complete with a mounting bracket, Fischer plugs and coach screws for the pipe outlet. The outlet connects directly to a 50mm PVC Pipe. The “Polyrinal” is available in either grey or white, and is easy to clean when required.